JOMALIG ISLAND QUEZON |To be able to be of service to the community is one of my primary goals as a traveler. Specially f if you are given a chance to be part of an outreach service at an island that is not explored by many, such as Jomalig Island. This was the reason why I decided to join Team Hamog in their Share It, Give a little and you will Love It. Feeding Program at Jomalig Island . Team Hamog originally was created as a group of mountaineers. In addition to that, their group is also very active in the running community where I met some of them. But the primary mission of the group is not running but to explore nature and nurture the interest of the people with regards to awareness of protecting our environment. That is why when I got invited to the feeding program, I said YES straight away! This feeding program was the idea of Mr. Dany Consigna, a very good food caterer and an individual who has a big passion to help others. With him was OutdooRian Dela Torre , a person with a mission to serve and inspire others through community service like this one. I’ve never tried camping before, so I was so keen to be part of this trip. We boarded the boat at 6:00 am similaer to the boat pictured below. The boat was quite big and can accommodate 40-50 persons in one trip with the travel time of 6 hours. I like that they have a roof deck where tourists can relax and catch up with their sleep. The morning see breeze was also quite relaxing. Meals were inclusive and were prepared by Danny Consigna. While on the boat, we had delicious chicken strips plus the best mango – buko pandan dessert that was to die for! It was a good brunch and volunteers got a chance to get to know each other better! Few hours from our destination, we repacked all the goods and items that were donated to the community. It was very overwhelming to see the donations received for this program. When we arrived at the Barangay Talisoy, we were already welcomed by these children. The smiles and excitement from these children were very evident as we arrived. It was also good to know that the local officials and tourism officer were also there to support this program. While the program was taking place, Danny and the others were also busy preparing for the feeding program. Program started smoothly and everyone was so excited . We included games in our program specially with the kids. Even their parents and other spectators were in full support of our feeding program. At the end of the feeding program, Team Hamog also donated slippers for the kids that they could use everyday. During the entire process, all I felt was pure joy and happiness! To be able to do this just opened up my mind as to what I can do to help even in simple ways for our community. Fishing is the primary livelihood in the island, and to see and touched a live lobster, that was something else! After the succesful feeding program, it was time for us to move to a different location where we will spend our evening. And one of the best place to camp out in Jomalig is at SALIBUNGOT BEACH. A beautiful and unspoiled beach surrounded with Agoho Pine Trees add up to the character of this beach. There are no resorts and toilets around here. All you will find is a small fishing community where we found a deep well pump where we could wash up. It’s nice to be on your own in this beautiful paradise! We walked from our base camp around the beach and I felt so free! I hope this place stays like this because this is what the tourists want to see. Everyone was just having a great time at Salibungot beach. Night time arrived and what Sir Danny did was something very memorable. He set up this beautiful candle-lit dinner at the beach for all of us. Such a great way to celebrate the success of the feeding program. I was really impressed! 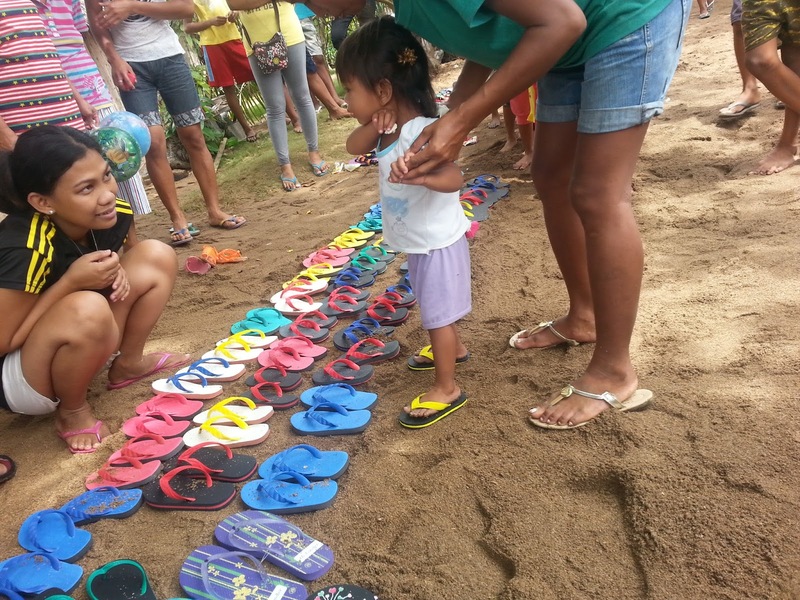 We still had enough slippers to give away, we also gave some to the children of Salibungot beach. Even though we had lack of sleep and were all exhausted yet we knew we made a lot of people happy at Jomalig. That for us was more than enough to leave the island with a joyful heart! Before we went straight back to Real port, our boat stopped off shore and gave us time see underwater landscape. The visibility of the water perfect for snorkeling and the amount of corals and marine life was spectacular in the island. I would like to thank Team HAMOG specially to Danny Consigna and Rian DelaTorre for the opporunity of making me part of this worthy cause. And also for us all to discover the beauty of Jomalig Island. I know there is more to see about this beautiful island. I know that someday more tourists will visit this place. And as for me, I will be back for sure ! I Love That you took us on this Adventure Angelo!! Not only did you get away to a beautiful place You got to be of service ! I Really Love That!! [ Smiles ] Being of service to others is one of the best things that we could ever do! in love with the beach, really beautiful. Hi Lucy, sorry for the late reply. yes I am going to email you soon. I am very happy that you are going to do an outreach program in Jomalig. That province is consider as one of the poorest places and the rate of malnourished children is quite high.